I am designing a ribbon burner forge. The interior cubic inches (after wool and refactory) is1600cubic inches. This interior will be divided in half. Each half will house a burner. 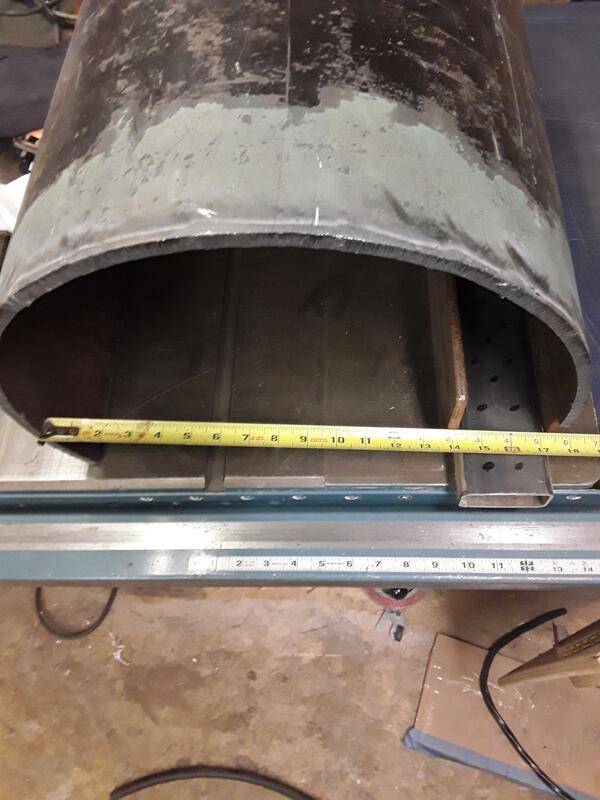 I can do math, but I am not sure how to calculate how many outlet holes I need to cast in the burner to bring each individual chamber up to welding temp. One each, well tuned 3/4" NA burner will reliable bring 300-350 cu/in to welding temp. A 19, "crayon diameter," outlet ribbon has proved to be reasonably stable driven by a 3/4" jet ejector. (T burner type in my case) I've found the two I've built will bring 700 cu/in to welding temp easily. If you believe in a margin of error it looks like you'll need 4 of them, maybe 5. Is there a reason you want so huge a forge? It's so large I don't know what advantage using multi outlet burners will be. Frosty the forge will be separated into 2 chambers. If and when I need the full interior space I will remove the divider wall. This will have a ribbon burner for each chamber, not a NA burner. "NA" means "Naturally Aspirated", and a ribbon burner can be either NA or blown (that is, with a fan-driven forced air supply). Frosty is talking about the NARB: the Naturally Aspirated Ribbon Burner, as described HERE, which is basically a naturally aspirated venturi burner with a plenum and a multi-outlet refractory block stuck on the front. Are you saying that you're planning to have a blown ribbon burner for each chamber of the forge? Yes, a ribbon burner for each chamber. The ribbon burner(RB) will be powered by a blower. So based on Frosty"s info. I could cast a RB that is 3X7 with 20-24 holes, and it would heat a 800 cubic inch chamber to welding temp. Keeping in mind that it will be powered by a blower. For a blown burner the exact number of holes is not as crucial since you're forcing the air/fuel mix. Having said that it's not just about the number of outlet holes. The diameter of the the inlet tube to the plenum and the size and the shape of the plenum can affect how well it performs as well. 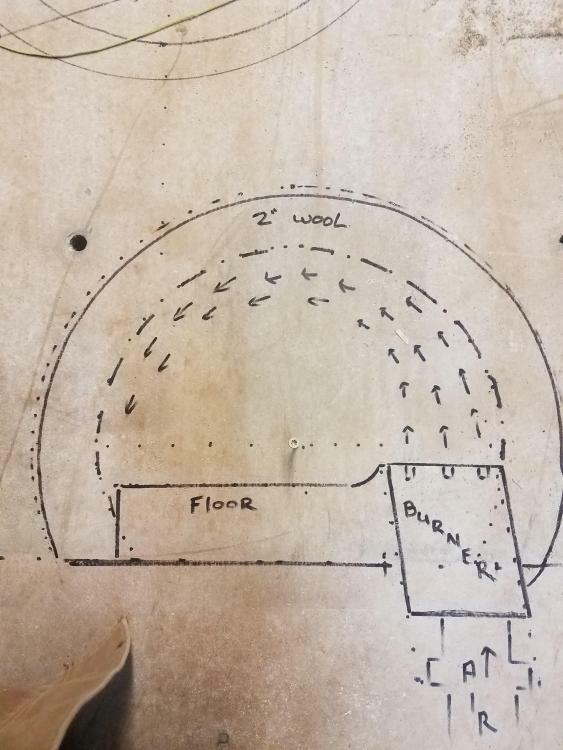 If it were me I'd want the burner to be somewhere in the range of 1/3 to 1/2 the total length of the forge chamber. If you center the burner that will leave you with 1/4 to 1/3 of the length of the chamber on each end without direct flame impingement and it should provide a fairly even heat. You'll probably want to go up to a 1 inch feed pipe (at least) and then just add enough outlet holes to space them evenly along the burner block. Just use the same pattern of holes for the smaller ribbon burner and extend it to the full length of your burner block. I've tried to find a way to calculate the size and number of holes for the naturally aspirated ribbon burners, but I haven't come up with anything reliable yet. It's not just about the total area of the outlet holes. It appears to me that the smaller the holes and the deeper the burner block the more friction plays a part in the equation. Sorry I can't give you a more definitive answer than that, but with DIY projects we generally don't operate in tight enough tolerances or control all the variables well enough to be able to give exact numbers for something like that. The burner will come into the forge on the bottom and pointed up. No direct heat on the metal. It may not be as crucial, but it is still an important variable. You have the same issue as with a NA burner regarding flame front velocity and desired heat output that needs to coordinate with the overall amount of fuel being introduced into the chamber. It is a very complex system, as the flame front velocity changes with the temperature inside the chamber (at least it appears to from my experience with such burners). You still want a stable flame that doesn't burn back into the burner ports (regardless of how many there are) or lift so far off the outlet that combustion is irregular. Most likely experimentation will be required (or you could just copy a Pine Ridge or Joppa Glass burner block design). I agree it is easier with a blown burner than a NA burner (which is part of why I'm so impressed with the NARB), but it is still not a simple thing to design. That's how my current forge is configured, although my floor extends to the outer shell on both sides. My forge chamber is only about 9 inches long though and my burner block is about 5 inches long, which leaves 2 inches space at both ends where there is no direct flame path in those areas. I get very even heats with that setup, which I find particularly helpful when welding damascus billets. Again TY Buzzkill. That will also be the main function of this build. Doing some research, so I only have to possibly build it once. It may not be as crucial, but it is still an important variable. Agreed. 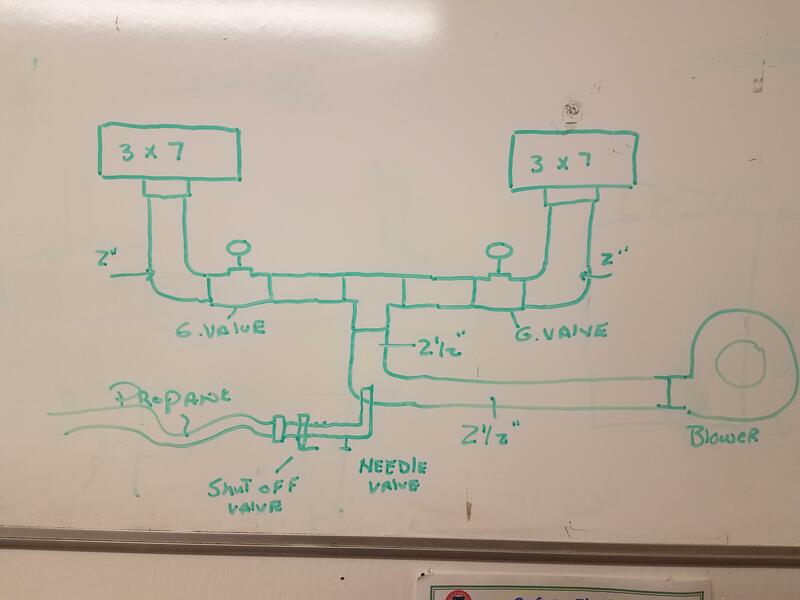 I'm assuming (perhaps incorrectly) that if we use a known working configuration and use the same pattern and diameter of holes in a longer burner block that we should still maintain close enough to the correct ratios needed as long as the supply side is increased as well. It's where I would start anyway. That will also be the main function of this build. If you're planning on doing a lot of welding I would suggest that you design your forge to have a removable/replaceable floor plate, such as high alumina kiln shelf. Borax will gradually turn Kastolite 30 into a gooey mess at forge welding temperatures. Normal kiln shelf is only slightly better. A layer of Matrikote helps decrease that tendency, but if you can remove and replace the main floor area as it gets damaged that will save you from rebuilding as often. That's the main thing I did not do on my last build that I wish I had done. It will be in the next build. Will a small stainless tray work on the floor as well? Also does the wall( were your burner flame hit) show any sign of heat damage? No metal components will have the durability to last inside the forge. At welding temperatures, you might even get them sticking to the workpiece. NO, the ratios I use do NOT apply to a gun burner. (blown) All my experimentation and posts have to do with NA (Naturally Aspirated ) burners, no blower. At this point I'm afraid you're searching in the dark. I don't think you're even asking the right questions, the # of outlets has more to do with heat distribution than simple heat output. If you're getting welding heat SS won't last very long, especially not a tray on the floor. Just use a refractory or kiln wash that isn't susceptible to molten flux. YES the liner is susceptible to a propane flame hitting it. Propane flame is darned chemically aggressive. Yes. My inner liner is about 1/2 inch thick Kastolite 30 which is covered with a thin layer of Matrikote. I don't know how many hours of use before it happened, but the Kastolite layer has cracked near the burner. I filled the crack with more Matrikote and have continued using it, but as you've probably already picked up on here the linings in a forge chamber are susceptible to damage over time and will have to be repaired or replaced periodically. Welding heat compared to forging heat will increase the frequency of needed repairs. Let me k ow where I went wrong in the picture above. You have no way to independently control the amount of air or fuel to each burner. Your gate valves are only regulating the flow of the mixed fuel and air, but I suppose that opening further would allow more air through and lean out the fuel to air ratio. This setup might work out ok, but I'd prefer to have separate air and fuel input controls for each burner. My blown burner experience is limited and I've never used a blown ribbon burner, so maybe someone else can chime in here. It would be much easier to have independent air/fuel adjustment (for each blower). To be able to tune for both ribbon burners simultaneously could be achieved with a plenum, but testing designs to achieve this without having back pressure issues would take multiple iterations. Not only that, but experience with plenum design and sheet metal. I'm getting excited just thinking about it. I am building a multi-port type forced induction forge for working everything from small knives to larger choppers and the occasional dagger. The pattern-welded billets for these will easily fit in my chamber, and it's only 5in tall, 6in wide, and 9-10in deep with a vault cross-section. If I ever make a long dagger or short sword, I have a passthrough. Just something to think about. Adding another fuel injection for the second burner seems to be an easy enough fix. What about the pipe diameters that are shown in the picture? 2 1/2" for the pipe directly off the blower, then dropping to 2" after the T fitting. I am under the assumption that a larger diam of sq inches should be used, than the total sq inch of the combined "straw" ports. Am I in left field on that assumption? Usually with blown burners you'll see a mixing chamber after the fuel is introduced. Frequently this is just a larger diameter length of pipe with a reducer at the other end which is the diameter of the final run to the burner. Corners also help with mixing the fuel and air. I don't believe there's any direct correlation between the sum of the area of the outlet nozzles and the inlet pipe to the plenum. What's important is that the fuel and air are mixed well and that the velocity through the individual holes is greater than the velocity of the flame front. This is necessary to keep the flame from burning back into the plenum. As long as that is achieved the burner should function. There are undoubtedly some practical limits though. For instance you probably wouldn't want to feed the plenum with a 1/4" diameter pipe at 100 psi (numbers are just made up). However, if you are within a reasonable tolerance it should work out ok. I am curious about what you plan to do that will require a 1600 cubic inch forge though. That seems really excessive for pretty much any hobby type of application I can think of. Even 800 cubic inches seems really large to me. For reference sake my forge is around 250 cubic inches and I weld damascus billets and forge knives having an overall length 18 inches or a little more in it with no problems. TY Buzzkill for the info on the pipe diam. 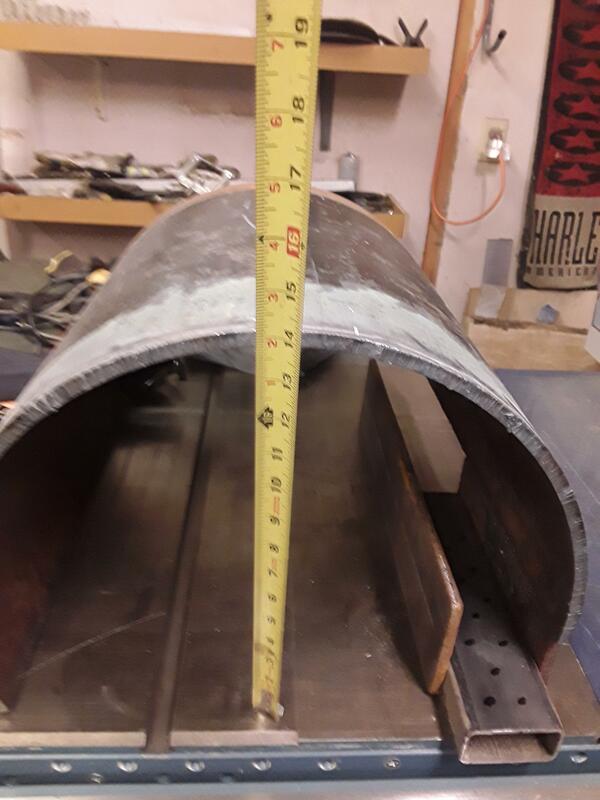 The numbers I am working with are a bit misleading.....in a way...To get a 6"-7" wide floor space, along with a floor mounted ribbon burner, 2"+ wool and refractory I have piece of 18" diam pipe that I have cut. So needless to say the width is right ... but the height is a bit much IMO. That height adds a lot of unusable cubic inches just to get a swirl action, and no direct flame on the steel. I have a 4X8 sheet of 1/8" steel for plan "B" that I can fabricate into a not so high forge. Decisions, decisions!! The length of 20" would be used once in a blue moon for ornamental pieces. I would rather it be there and not use it very often....than to need it and not have it. As I stated before . I will have a removable wall for a divider.